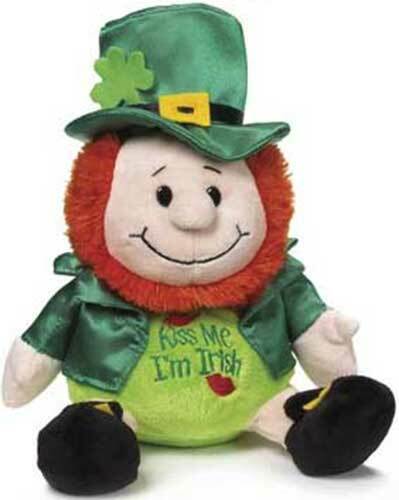 Plush leprechaun doll with shamrocks makes a kissing sound when activated. This Irish leprechaun doll would make an ideal St. Patrick's Day decoration. This leprechaun doll has a red beard and a top hat with a shamrock. Kiss Me I'm Irish is embroidered on the leprechaun's tummy and when you press his shoe he makes a kissing sound. The stuffed leprechaun is enhanced with a green jacket and is 9 1/2" tall. The kissing leprechaun is complete with a shamrock history card, complements of The Irish Gift House. Plush leprechaun doll with a shamrock is a great baby or child's gift. Plush Irish lamb features an embroidered shamrock on its rump along with a green scarf that proclaims Ireland. Irish lamb doll features an embroidered shamrock on its belly along with a green scarf that proclaims Ireland. Irish Teddy bear is a plush doll holding a green shamrock; he would make a great Irish gift for a child or baby.